For this month's edition of Pub Magazine (nr. 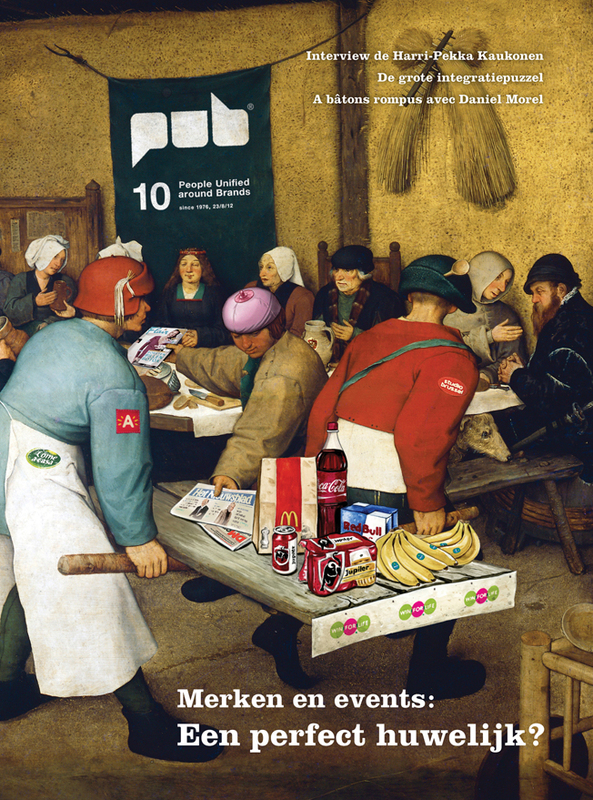 10, 23/8/12), we hired Pieter Bruegel the elder. On the theme of how brands use events to make their mark or strengthen their messages, we developed a 2012 version of "The Peasant Wedding". The image speaks for itself: brands and events still make a perfect wedding; and they are both of all ages. You can look up the original in the Kunsthistorisches Museum in Vienna, Austria. Gutzandglory's Didier Naert, David Libeert and Kevin Put conceived the idea. The illustration was made by the hand of Rudi Vanhecke. Furthermore, we would like to thank Getty Images Belgium for their support in clearing the rights for the painting's picture. Moreover, this edition of Pub is entirely enveloped by GutzandGlory: on the back cover and on a blister card joining it, you will find the Sign2Com advert inviting you to visit the event—a 3-day fair on visual communication in all its forms. See www.sign2com.com and register.